It is time for action and not just words. Join the picket lines this Saturday, August 12, from 9 AM to noon. 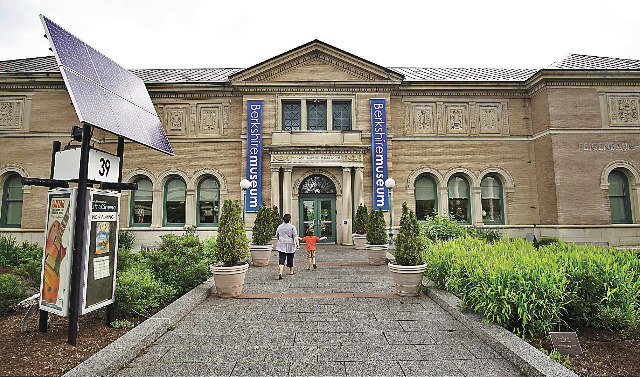 There was an aura of secrecy and lack of transparency when the Berkshire Museum announced radical plans to sell key works from the fine arts collection and gut its historic, art deco, Crane Room and auditorium with two Calder Mobiles, in order to "reboot" as a children's interactive museum for science and natural history. Initially, the Berkshire Eagle praised plans to save the museum from extinction some eight years hence. That changed when Laurie Norton Moffett, director of the Norman Rockwell, in an Eagle op-ed piece called for a "pause." There has been a firestorm since with pro and con articles lashing daily through the Eagle and spreading like a forest fire to national media. While museum director, Van Shields, states that he has followed media reports he is unswayed in going forward with the sale and extreme makeover. In essence he dismisses a few dissidents and claims to have the support of the majority of the community. MASS MoCA director, Joe Thompson, in an Eagle article supported the "reboot" urging protesters to "get real" about the museum and its lack of options. Then Rockwell's three sons and grandsons posted a letter stating that it was not the artist's intent to see his works sold to makeover and gut the museum and community he supported. Even the Eagle has run an editorial faulting the museum for withholding financial reports, essential documents, and details of plans for programming, budgets, and projected attendance targets. Part of the museum's problem has been an absence of curators for exhibitions and programing including its haphazard and underattended Little Art Cinema. While claiming that the museum can't afford essential professional staffing Shields has deep pockets for expensive attorneys, consultants, and spin doctors. These are wrong headed priorities. On Saturday, August 12, from 9 AM to 12 PM, there will be picket lines in front of the museum. Concerned citizens are urged to attend. "It has also been suggested that the value of the museum's fine art (and most likely other non-art holdings) has appreciated more than the stock market or bonds. They already have an "endowment." So what's the rush in selling? And why start by selling their art "crown jewels?" And why then ruin the building with changes that will become outdated quickly enough (and kind of looks like every big hotel-lobby)? It needs fine-tuning, not drastic destructive remodeling. Imaginative programming, reduction in operating expenses, and a sensible but creative program - that's the way to go. And of course, a fresh look at the proposed plans by new eyes."